Hi! I’m Eliza Fisher, Annex Cloud’s Marketing Strategist and Editor. I live and breathe e-commerce, and I have tons of thoughts about how I, as a female millennial consumer and too-frequent online shopper, should be marketed to. Why should you care? Well, there are about 80 million millennials in the US alone, and we’ll have $1.4 trillion in disposable income by 2020. Many millennials, myself included, have notably strong relationships with their families and consequently influence more purchases than just their own. Also, we’re young, so now’s the time to earn our loyalty. As for the woman component–all opinions are valuable, but women drive 70-80% of all purchasing decisions. Now, of course, marketing is a wide field with many disciplines, so today I’m going to focus on the still vast, but more specific, area of on-site marketing. I have enough information to know that I’m going to really, really like what I buy. I’m working with a reliable seller who sells quality products, ships things on-time, won’t stiff me on extra fees, and will provide useful customer support. Now, how can you convince me that you’re fulfilling these three criteria? Let’s break it down. Product details: Many online sellers do this, but it’s worth stating. Tell me about dimensions, fabric composition, ingredients, special features, and so on. Once we get these standards out of the way, there’s a lot that other consumers can tell me. I’m a frequently online shopper due to the convenience, expanded selection, and better prices I usually find, but there are some things I miss out on by not checking out products in person. When sites provide user generated content from shoppers just like me, I get a much deeper understanding of what I’m getting. I’m not alone, either–84% of millennials say that on-site user generated content influences their purchase decisions. Here are three specific tactics to consider. Unless I’ve already purchased the product in question, I always seek out product reviews. While I notice the product’s star rating, I scan the reviews to see exactly what other shoppers’ comments are and whether or not they apply to me. For example, I’m not a very skilled cook. When I’m shopping for cookware or other kitchen products, reviews from expert chefs won’t be very relevant to me. Or, when I’m looking at skincare products, I’m not paying attention to reviews from consumers who are concerned about wrinkles, but I do want to hear from those who also have acne. For example, I’m not a very skilled cook. When I’m shopping for cookware or other kitchen products, reviews from expert chefs won’t be very relevant to me. Or, when I’m looking at skincare products, I’m not paying attention to reviews from consumers who are concerned about wrinkles, but I do want to hear from those who also have acne. Murad, a skincare line, lets reviewers select specific concerns of theirs. Question and answer interfaces also provide me with helpful information that’s often more targeted than that coming from product reviews. I can ask a specific question and get an answer from someone who’s already purchased the item or from a product expert. 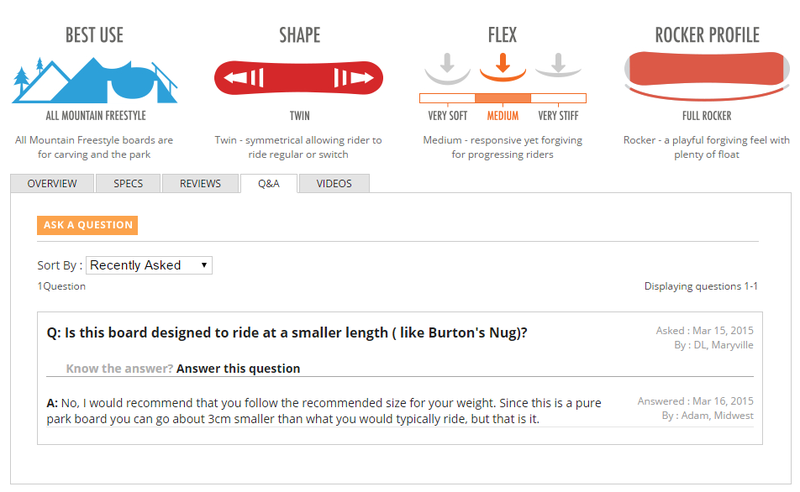 Snowboards.com uses Q&A to provide extra information about their technical, expensive equipment. Honestly, I prefer it when many other shoppers have already asked questions and had them answered. I’m impatient and I often don’t want to wait to hear back from someone else before I buy something. You should capitalize on my eagerness to purchase by providing all the information I want at my fingertips. That’s why expertly soliciting and incentivizing contributions to your questions and answers platform is so crucial–check out my post about it here! I feel that customer photos usually convey products’ appearances more accurately. After all, I’m not a model and I don’t have an immaculate, well-lit photo studio instead of an apartment. Consumer images are also a source of inspiration. 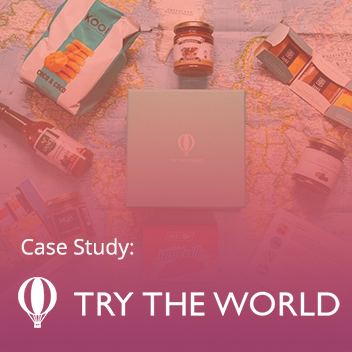 Whether you’re using visual commerce to sell groceries, clothing, home goods, cameras, or anything else, it’s vital to get your shoppers to think of your products in new contexts. Maybe I dislike the stock photo of that dress, but it looks really great on a customer, or maybe I never thought of roasting peaches before…the possibilities are endless! 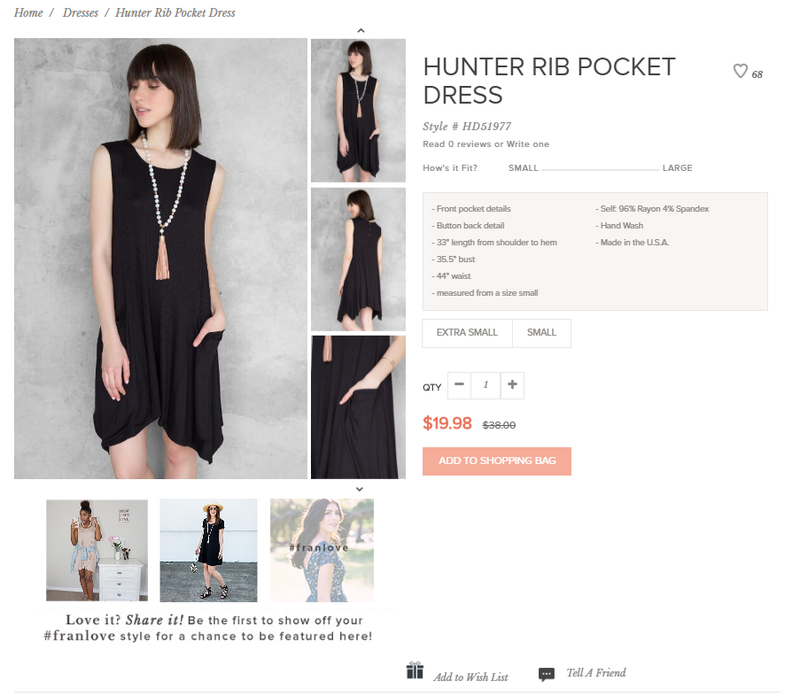 Francesca’s uses visual commerce on their PDPs to give shoppers a fuller understanding of their clothing. 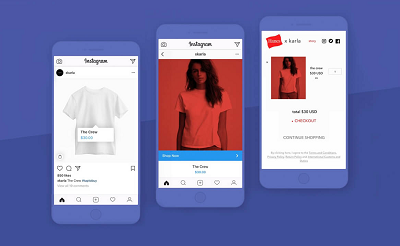 My team and I have written a whole lot about visual commerce and its business case, best practices, and use cases. Here are some links. Between these three forms of user generated content and the information that you and your team provide, you should have no problem giving me all the tools I need in order to know if I’ll really enjoy your product. With that, let’s move on to the question of convincing me that I’m getting a deal. 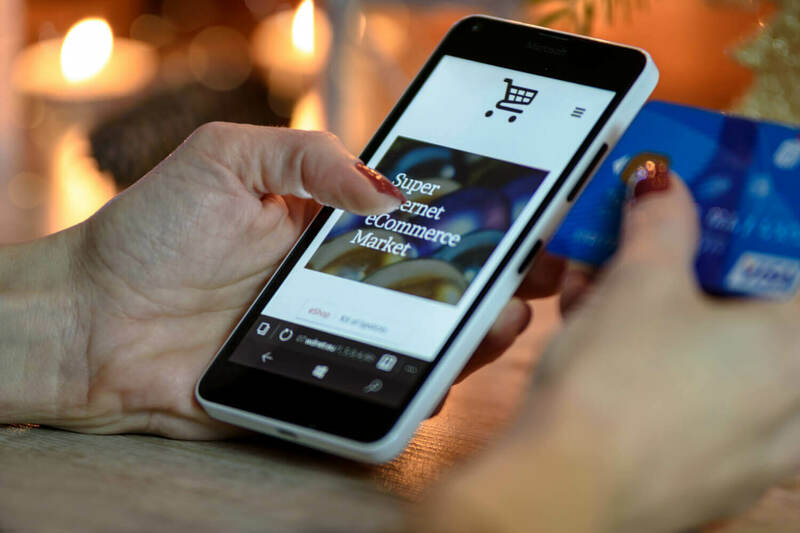 There are many pricing and discounting techniques that merchants of all kinds should consider using to drive conversion. Here are some that work on me. This simple principle means that “some perception (say, weight, brightness, or sweetness) will appear greater or lesser depending on a perception that came immediately before it.” In the world of pricing, it just means that deliberately mixing in more expensive items with less expensive ones will make the less pricey ones look like a much better deal. Case-in-point: Williams-Sonoma was struggling to sell a $275 breadmaker. Their team then introduced a $429 breadmaker and placed it near the other one in their catalog. Sales of the cheaper appliance nearly doubled! When you use regular discounts as incentives for actions like signing up for your email list or referring a friend, make sure that they’re coherent. 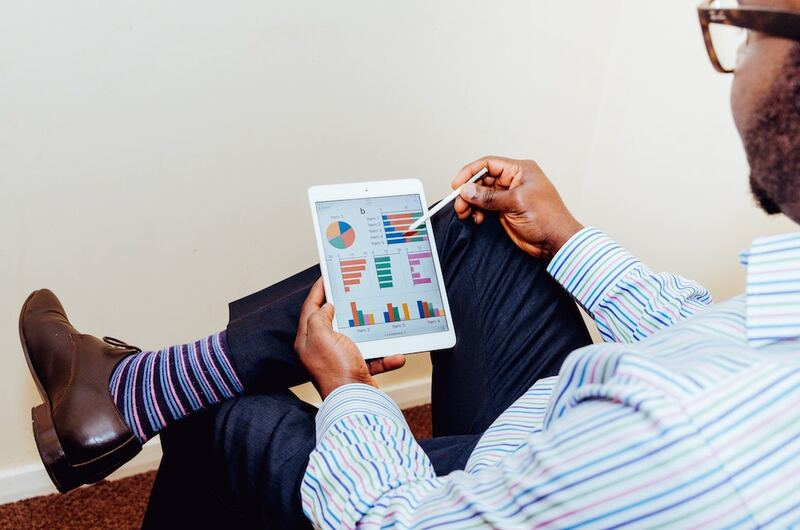 Of course, it makes sense to incentivize these actions–particularly referrals. You automatically get at least one user’s email address when they make a referral, and at least one other consumer gets exposed to your brand. 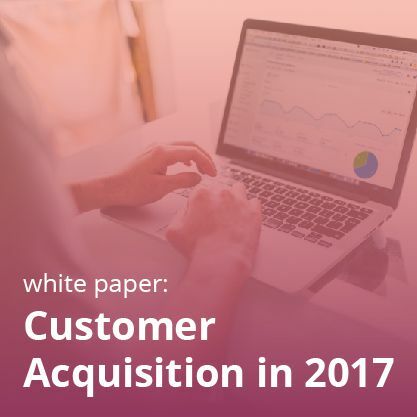 77% of shoppers are more likely to buy when they learn about a product or company from a friend, and Annex Cloud just published a case study showing a 10:1 ROI and a 38% increase in orders thanks to Social Login and Sharing and Referrals. When I decide to send a friend a referral, it’s a pretty big deal. I only do it when I’m positive that the business has something that my friend wants, or when the deal on my end is too good to pass up. 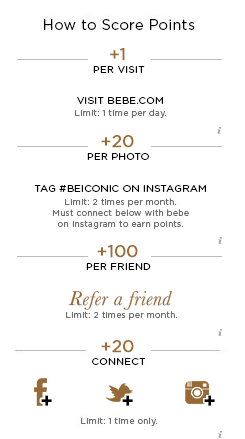 Of course, I’ll weigh my potential referral discount against any other discounts going on. Here’s an example of what an ineffective referral discount strategy looks like. Let’s say I’m looking for a new suitcase and I found something I like on eBags. I also know that Christmas is coming up and that my mom is interested in purchasing some luggage for someone else. eBags offers me 20% off just for signing up for their email list. Pretty good, right? It is! If I’m looking at a $150 suitcase, 20% off saves me $30! Now, as I’m exploring my discount options, I come across their Refer a Friend page. It tells me that I can earn $10 in rewards points while sending 20% to my mother, who wants to buy some luggage too. There are two big problems here. First of all, my referral discount is a third the size of my sign-up discount. Even if I were a returning customer who was no longer eligible for the sign-up bonus, the referral offer just doesn’t sound good in comparison, and I’m more likely to go to another site in search of a better deal. Secondly, my mother will get the same discount whether she goes through me or uses the sign-up bonus. Let’s say I send her a text telling her about eBags and letting her know that I’ll be sending a referral code very soon. Then I get distracted by something else, while she goes on to the site for the first time. She might be too impatient or unmotivated by the non-difference in the discounts to wait for my referral link, and ends up purchasing using the email sign-up discount. What’s the problem for you here? I’m less motivated to share again, and you haven’t properly tracked the source of my mother’s purchase. Check out our referral best practices ebook for more tips about referral incentives. 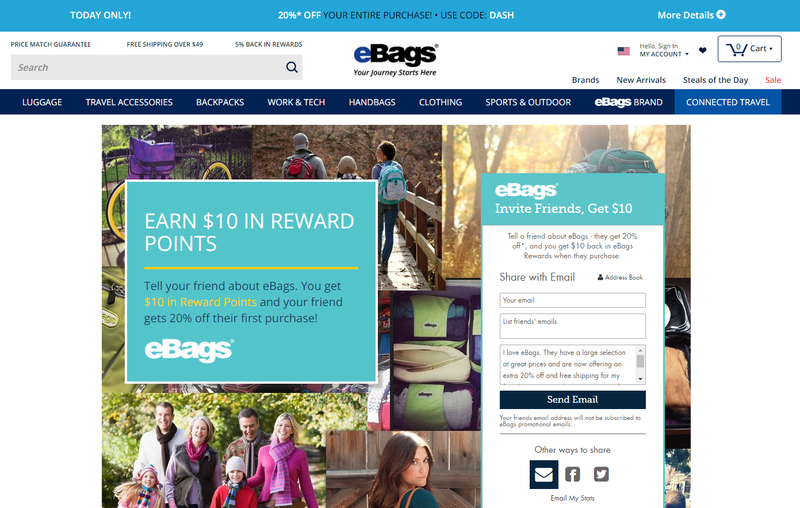 One of the things that eBags did correctly in the example above was to loop their refer a friend program in with their loyalty program. 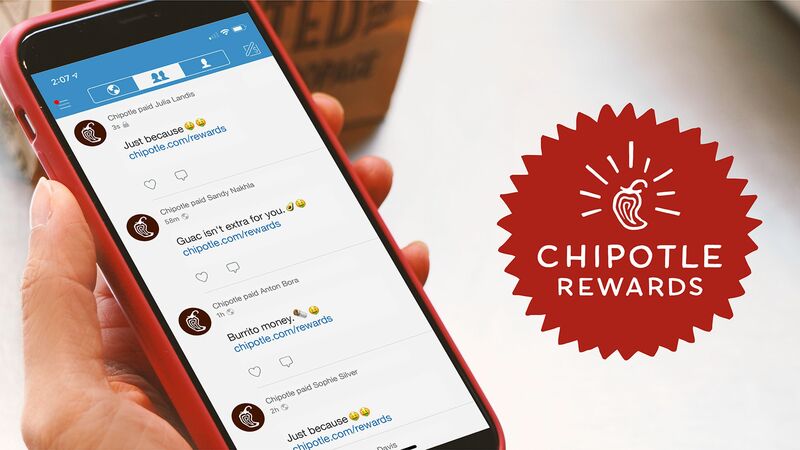 On your end, loyalty programs should be used to make sure that I keep coming back and to turn me into an advocate by incentivizing referrals, review-writing, photo-sharing, and so on. The analog to these two ideas is that I want to feel like I’m getting a deal because I shop with you frequently and because I go out of my way to do things for you. Luckily for both of us, when you reward me for advocating for your business, I accrue points more quickly. That means that get the sense that I’m racking up discounts and consequently treat myself more frequently, while you see customers return to buy more often. Annex Cloud has seen that when companies switch from a traditional, points for purchase model to a loyalty program integrated with advocate marketing actions, loyalty program revenue increases by at least 300%. 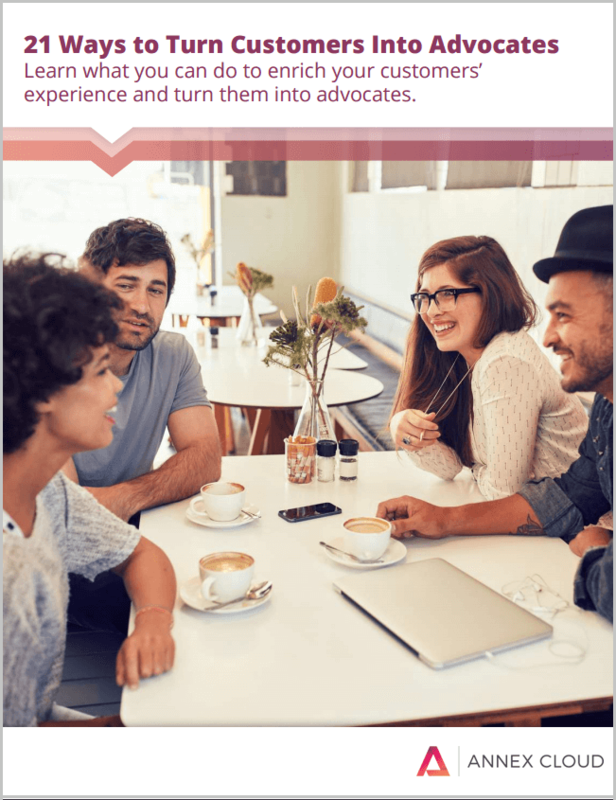 Check out our ebook all about advocate loyalty for more details. 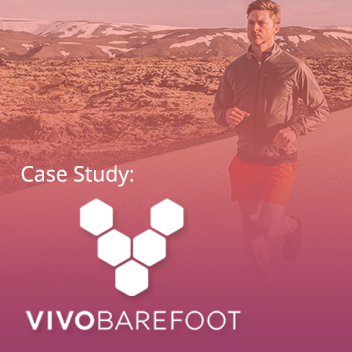 We’ve already touched on a few things that are marks of trustworthiness–namely, user generated content and referrals. If a site has good, but not suspiciously good, reviews for its products as well as helpful customer photos, I’ll know that other shoppers are satisfied. If I come to a site after being referred by a friend, it’s clear that someone I personally know trusts that site. How else can you establish reliability? This should be painfully obvious. I’m impatient. I’ve been trained by Amazon Prime and other businesses to expect my orders to arrive in two days. When they’re even a day late, I sometimes get a little offended. What can marketers change on their website to soothe my concerns? Just meet the standards that other companies are setting. I would prefer to pay a little bit more money, whether it’s a shipping subscription, it’s factored into the price of the item, or I buy another item to meet the minimum shipping threshold, rather than think that I have to pay extra for shipping. I have a Prime subscription and I pay for ASOS’s unlimited two-day delivery and free returns. At the end of the day, I know that I’m somehow paying for delivery, but I want to think that I’m just paying for a product. When I look at the checkout screen and see an actual number amount next to the “shipping” section, it feels like an unnecessary charge. Conversely, when I’m checking out and see that shipping is free, I feel like I’m getting away with an exclusive deal. The other side of free shipping consists of free returns. I want to know that you stand by your product and won’t make it hard for me to return it if it doesn’t suit my needs. Amazon irked me recently when I used a gift receipt to return something my brother had bought me for my birthday. He and I both have Prime memberships, yet Amazon still knocked about $10 off of a potential $40 store credit for return processing. While free returns are nice across the board, this seemed like a pretty significant insult to two very loyal customers. If you find that your margins just can’t handle free returns, consider doing what Modcloth does. They’ll deduct a processing cost from your refund unless you choose to return your purchase for store credit. In that case, the return will be free and they’ll give you an additional $5 store credit. I chose this option recently, and will almost assuredly now use my Modcloth store credit towards a larger purchase on their site due to my perception of this sunk cost. Modcloth has flexible return options. While I know that every company must make judgments about its resources, customer service is obviously a huge deal. 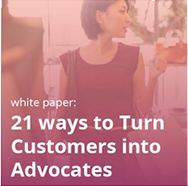 How you enable communications between support and shoppers is equally crucial. True to my millennial stereotype, I hate picking up the phone. I vastly prefer digital text communication, ideally through chat. Here are two ways of illustrating what I want. A few years ago, I purchased a pair of shoes from ASOS. The first time wearing them out of the house–on a casual stroll around my neighborhood–one of their straps broke. I tried to find a way to directly talk to customer support on their site but found myself in an endless maze of questions regarding the nature of my complaint. Of course, none of them applied. Frustrated, I took to Facebook and posted a photo and a short, snappy caption on ASOS’s page. Unsurprisingly, I got a rapid response over Facebook Messenger, asking for my email and order number in order to start the refund or replacement process. The language of whomever was on the other end of the chat was casual and cheerful enough that, combined with the ease of the process, my annoyances were forgotten. So despite the fact that ASOS didn’t have the ideal tools for me to file a complaint, their speed and demeanor were enough to make me forgive them. On the other hand, we have Salesforce’s Pardot. Admittedly, this is not an e-commerce site, but there’s still something to learn from them. If you sell anything that’s technically complex or pertains to a field of professionals or devoted hobbyists, your customer support requirements will be similar. Pardot is a marketing automation platform that does emails, drip campaigns, scoring, data capture, and more. Users spend a lot of time on Pardot’s site because the features are extensive and time-consuming. Pardot has several resources when it comes to support: an FAQ of sorts, a live chat, user forums, “office hours,” and then the ability to file a ticket via email. All of these options combined should give users everything they need to master the software, but instead the resources are spread far too thin. The FAQ is far too rudimentary, the live chat is only available for about an hour out of my workday, the user forums are messy, the office hours are overcrowded, and the email tickets take too long. In essence, nothing is helpful and the site would definitely benefit from shedding some of its efforts in order to devote more attention to others. My picks–focus everything on live chat and spend a few hours every few weeks beefing up your basic FAQs. While it doesn’t take a lot of time to maintain a user forum, it looks terrible to refer a user to it. You’re supposed to be the expert. Give me the ability to know if I’ll like your product. Make me think that I’m getting a deal. Assure me that you’re a reliable seller. Fill out the form for more real-world examples of how to please millennials and foster advocacy! Awesome article! Very informational and well written. I’m speaking on this topic at Pubcon next week and appreciate the reinforcement on my thoughts and suggestions.